Don't it ever get lonesome? Don't it ever get sad when you go out on the road? Don't it ever get sad when you go out on a thirty day tour? Don't it ever give a young man the blues? Don't it ever make a young man wanna go back home? What the Road Ladies do to you? Now . . . now . . . now . . .
Tell me you love me, tell me you love me! The night you went to the show? Where did your brassiere go? The Monster From The U.S.O. Lift up your dress, if the answer is "no" . 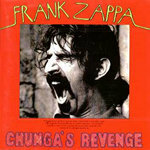 . .
Frank Zappa—drum set, wood blocks, temple blocks, boo-bams, tom-toms, etc. Any you boys not paid up on your cards? Huh? Wanna get a good look? Let me pull it right out! Let me whip it right out! Any you boys not paid up on your cards? Send my baby home to me!